Harry Potter, admittedly, never gets old. Even if the movie already had its last installment, many fans are still raving about the story that has captivated the hearts of the many from all over the world. Rowling has done an excellent job in writing the story, which is why it is still remembered by many up to now. Over the years, Harry Potter has been popular not only with the story but also with the merchandise associated with the book and the movie. For instance, many toys have been manufactured in the past to make it possible for people to experience what it is like to be in the same world that is depicted in the movie. Among others, the toy Gryffindor swords are amongst those that have been popular. If Gryffindor is your house of choice, given a chance to choose from the four homes, the different products that will be mentioned in the rest of this article are some items that you will surely not regret. This sword has been seen first at Harry Potter and the Chamber of Secrets book. From the time it has been shown in the movie, many people immediately got attracted to its visual appeal, making it a famous toy not only for kids but collectors and enthusiasts alike. 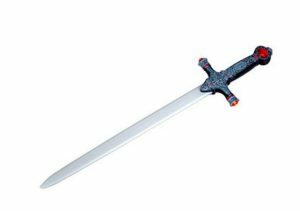 One of the things that you will enjoy with this 34-inch sword is that it has intricate details, which makes it possible to resemble the original version of the sword closely. To be indicative of the house that uses such, it has a ruby inset. To add, it also comes with a wood display. I recommend that you buy this toy sword if you would want to feel how it is like to be at Hogwarts, specifically at the house of Gryffindor. Even if this is just a toy and not the actual sword, you will surely enjoy using such or just seeing it on display in your room and causing lots of discussions. Compared to the two products that have been mentioned above, this letter opener sword can prove to be more functional. This is not a toy, but a letter opener. 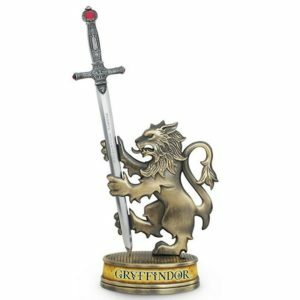 Also, it can also look good if it is placed at the top of an office table of a person who is a fan of Gryffindor. With the use of this letter opener, it is possible to add a spark of magic at home or office. I own this product, and I enjoy using it. The letter opener has a length of 8 inches, and it comes with a detailed lion holder that makes it look more visually appealing. If you plan to give this as a gift, keep in mind that it is perfect only for those who are aged 14 and up. While it may look beautiful, keep in mind that this is not a toy. If you see children playing with it, try to keep them away as it can cause injury. In the story of Harry Potter, aside from the sorting hat, the sword of Gryffindor is another essential artifact from the said house. 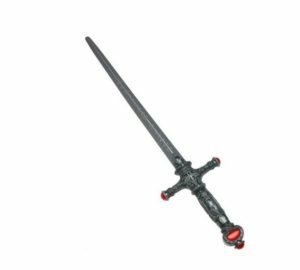 With this Waltzmart toy sword, it will be a snap for you to be in the magical world of Potterverse and have fun playing with the toy. Among other things, I like the fact that this sword is made from high-quality materials that reflect the durability of the toy. Besides, it is also very light, which will allow you to have more fun as you play with such. Whether you are looking for a toy sword for your own or as a gift to other people, this is one of the products that I can personally recommend. It is very cheap and can provide the best value for your money. If you do not want to play with the toy, you can opt just to put it on display along with other collectibles. 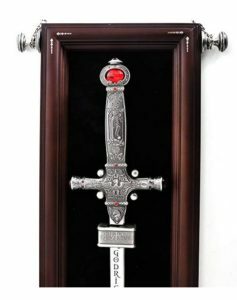 The Godric Gryffindor Sword by the Noble Collection is a beautiful replica of the sword seen in the Harry Potter movies. It comes in a gorgeous polished wooden case with embezzled stones, which gives it a royal look. The sword itself has the markings and engravings of griffins, lions and other mythical creatures. Red ruby stones are attached on the handle and the words “Harry Potter” are inscribed on it. The body is super sleek and the words “Godric Gryffindor” is written on it. A wooden hanger comes along with the product so that you can hang the sword in your living room and it would add a bit of magnificence to the house. The sword is made of steel. It is a beautiful decorative item. In my research, I have found that many parts of the replica are removable, such as the inscribed words. The screws, which hold the words in place, are removable. The sword can also be removed from the hanger. However, the restraining bolts must be removed manually, which would require additional tools. That can be a bit of a hassle. In conclusion, I think this is an excellent purchase for all Potterheads. The Harry Potter’s Gryffindor Sword by Mattel is a regal sword encrusted with red stones and filled with intricate designs around the handle. The words “Godric Gryffindor” are engraved on it, and the design of the item is true to the one shown in movies. It has some unique features that make it different from other renditions of the sword. It has 6 electronic fighting sounds, which go off when you play with the toy. I have found that children have fallen in love with the artefact, especially the swishing, clanking and swiping noises. These sounds create a unique feeling of being on an actual battlefield, which could be a very very enjoyable experience. However, the included batteries are weak and go out for a short while. While researching this product, I have read that there has been complaining about the batteries not being the AAA type, which may be an inconvenience. I think some may have also found the price to be a bit high. The sword is also quite malleable, which means that it can change shape and become bent. I have seen some complaints about the item becoming bent and not returning to its original shape. Overall, this is a very fun item to play with, especially for children. 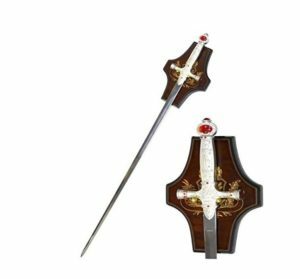 The Godric Gryffindor Replica Toy Sword with Sound and Light Effects from Universal Studios is a plastic-made rendition. It has a light silver body with a dark grey handle. The typical scarlet stones seen in the Harry Potter movies are also replicated here. They sit atop the handle and complete the look of the item. It has an inbuilt sound feature, which is triggered when the toy is moved back and forth. This feature gives it an extra element of fantasy and makes the user feel like an actual wizard engaging in war. However, this very feature can turn out to be very irritating at times and the sound goes off at the slightest movements. The sword does not come with an off-switch either. This has disapointed some parents. I have seen some people complain about the packaging. Apparently, it is not neatly stacked and wrapped lazily, which could result in product damage while delivering. The sword is also easily misshaped while playing with it. After doing some research, I have found that while some parents have complained about the noise and small size, most children have loved this product and it is especially recommended for fans of Harry Potter.